Cape Town - Charl Schwartzel is looking forward to the Presidents Cup at Liberty National this week. The 2011 Masters champion will join his South African compatriots Louis Oosthuizen and Branden Grace in New Jersey. This will be Schwartzel's fourth Presidents Cup after participating in 2011, 2013 and 2015. In the build-up to the biennial tournament, an excited Schwartzel said he is in good shape despite not playing at East Lake in the FedEx Cup finale last week. 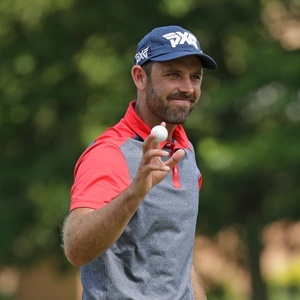 "My fitness is probably the best it's ever been in my career," Schwartzel told Sport24. "I've been playing really well and I'm starting to get into good shape. I normally do well after having a week off, so I'm really looking forward to playing at the Presidents Cup. "It has become one of my highlights. I speak to Louis (Oosthuizen) quite often about it and he's also just so excited. "There's a different feel (at the Presidents Cup) to what we play every week, you always feel like you're playing the same amount of pressure every day of a major at the back nine. It really is exhilarating and just awesome," said Schwartzel. There will be nine matches of foursomes, nine matches of fourballs and 12 singles matches in the four-day event with each match worth a point. Looking at the majestic Liberty National, which has a picturesque backdrop of the New York skyline, Schwartzel has only ventured on the course once (in 2013) when he played the Barclays PGA Tour event (now known as the Northern Trust). "I think it's going to be a great matchplay golf course and it's going to suit us well. There will be a lot of risk and reward. I think you're going to see a lot of holes lost and won, more so, than any other competitions," he said. "It's seems like it could be difficult off the tee, not all but you've got five or six holes where you need really good tee shots." The International team will be looking to break their sixth consecutive losing streak and having eight nationalities come together in a space of a few weeks has been a bit of a disadvantage to captain Nick Price. "If you look at the American team, they're all really good friends and they all hang out with each other every week. Where the International team has so many different nationalities that we don't hang out as much as the Americans would," said Schwartzel. "We have tried to set up a few meetings throughout the year. Nick (Price) has set up a message group between the guys and we've all been texting. We threw a big party on Sunday and get everyone to gel well before we tee off."